Just a number between Six and Eight? 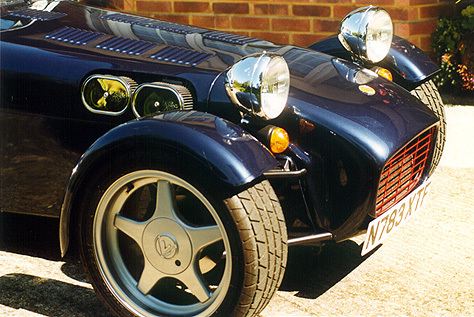 A Caterham Seven is a modern derivative of the Lotus Seven designed by Colin Chapman in the late 1950's. 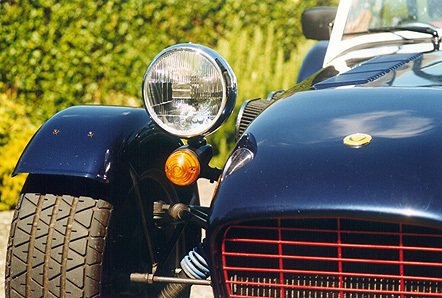 Chapman sold the rights to Caterham Cars who have modernised and improved the car since then but have always retained the basic design which made the car the outstanding success that it was all those years ago. When I was growing up in New Zealand in the early 1970's, I had a poster on my bedroom wall which featured the Top 40 Sports cars of all time, many of which were English (sadly, hard to believe today). 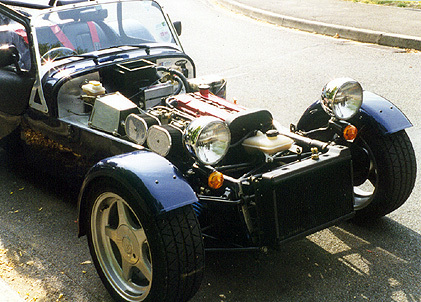 Amongst them was this funny little car which even then looked out of place next to the leading sports cars of that Era. Later, when I was in my teens, a Pommy friends Dad imported a fantastic yellow Lotus Seven which I can vividly recall being in awe of. 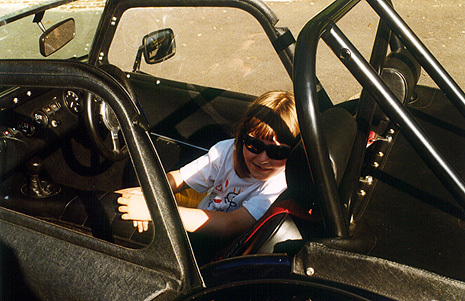 Incidentally, it's not my fault that I like fast cars as it's in the genes (at least that's what I tell Debs anyway!) - my Dad has a weakness for V8's, and his Dad was one of the first Kiwi's to own an Auburn Cord in the 1930's; quite a motor in those days. 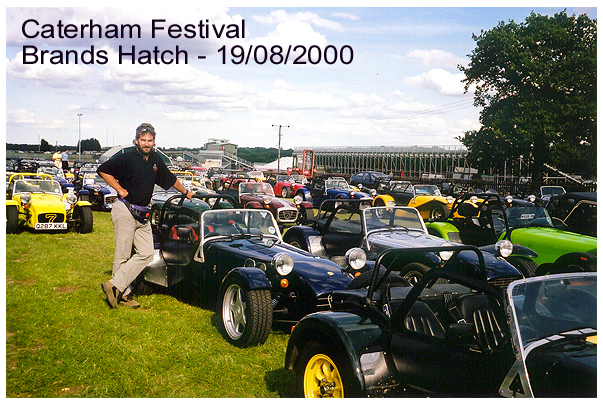 I had never heard of Caterham (the cars or the place!) until I moved to England and began seeing the odd one or two in the Croydon area where I lived for a while. 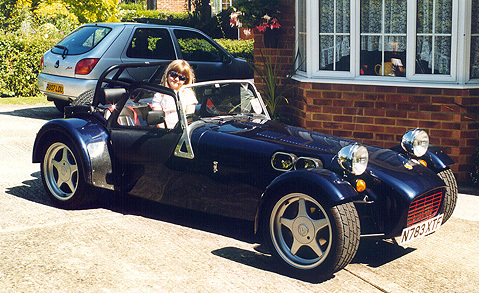 I can also remember the moment in the Caterham showroom a few years later when I set myself the mental ambition to "own one of these one day...." As a reader of this web page, with a probable interest in these cars, I guess you may also identify with this. I say that because most people who talk to me about the car, all seem to have the universal desire to own their own Seven one day. If everyone's wish is to come true, Caterham had better start increasing production as future demand is likely to greatly exceed the 42 years worth of vehicles already in existance! I first heard about this particular car when a work colleague saw it advertised on the AutoTrader website. I had been looking out for a good one throughout the summer of 1999 and as it wasn't far from where we live, decided one Sunday afternoon to go and have a drool at it, even though it was a higher spec than I ever envisaged buying. A week later, with insurance details etc sorted, I picked this fantastic little car up. 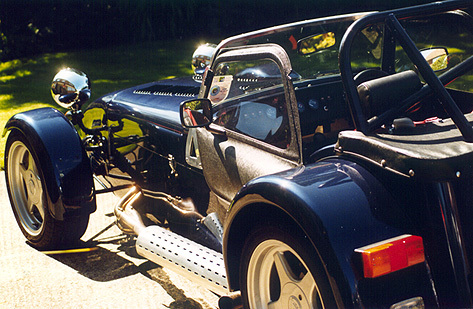 It is true that you don't just drive a Caterham, you experience it. 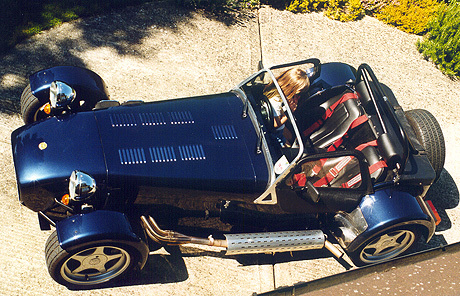 From the moment you drop down into the snug leather cockpit, grapple with the ridiculous 4-point harness, faff around with the Vecta gizmo, struggle to get the key in the ignition, and then fire the beast into life, it is unlike any normal road-going car. You don't realise how low you are on the road until you notice Nissan Micra drivers looking down at you - when you are strapped in, you can literally touch the road by putting an arm out. The driving position is so far back that you feel as though you would be sitting in the boot of a normal car. This makes the first few intersections a challenge as you tend to pull up with half of the front of the car over the line until you get used to it. The car rattles and bumps, also very worrying at first. Modern cars are so comfortable and divorced from what's going on outside but your Seven re-introduces you to what driving is supposed to be like again - raw and fun! Watching the front suspension working is fascinating as each wheel independently rises and falls (eat your hearts out "flared wingers" - this is worth a few stone chips on the rear guards any day!) You can also watch the world going by in the back of the huge shiny headlamps. 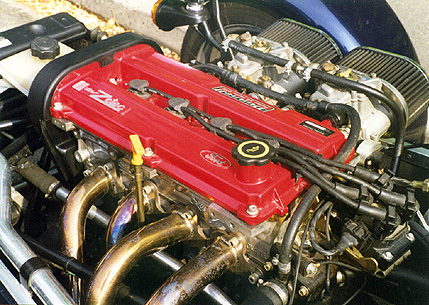 I don't know what other Sevens are like but the accelerator on mine is either your best friend or worst nightmare; feed it down gently and the engine will cackle into a satisfying growl, go over a bump or jerk it suddenly and the car will behave like it's been filled with 4-star Kangaroo juice! And the power... well let's just say there's enough!! P.S. Debbie is now not only talking to me again, but wants to go everywhere in it. Have now done 750 miles in my Seven and not needed the roof up once....must be a record in this country! Have been very fortunate with the weather as it was chucking it down the week before I picked the car up and ever since it has been sunny and warm. I've driven it to work each day, mostly down country lanes, but occasionally on the M40/M25. The car handles like a dream and corners that you'd "white knuckle" in a normal car go almost unnoticed. In fact when you get used to it, you feel that all other road users must be braking through every corner as you catch them so quickly. Haven't really enjoyed taking it on the motorway however. 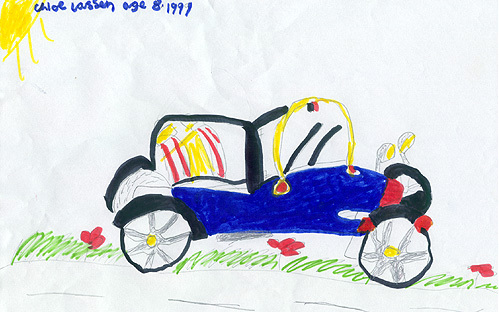 The steering seems quite twitchy at high speed and there are generally too many pillocks on the road. This car has motorbike-like acceleration (0-60 mph in approx four seconds)....have been "lined up" by a few try-hards (most notable was a Merc 500 convertible) but most have lost interest when they've been eating gravel and I still haven't gotten into third! The engine is quite tractable in slow traffic but is clearly happier above about 3500 rpm's. The clutch and gearbox tend to get a bit clunky if you're driving too slowly. 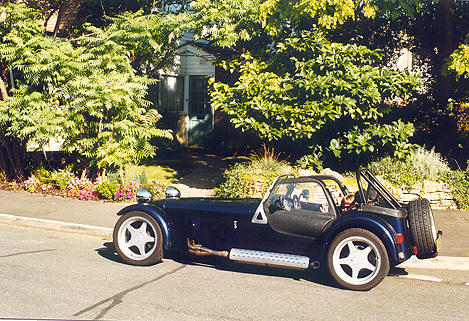 Am looking forward to driving it on those bright but cold spring/autumn days as the heat generated from the engine will make for a cosy ride. 1200 miles have zipped by and we still haven't really been anywhere (am wondering how I'm going to stay within the 3000 mile p.a. insurance limit with 47 weeks still to go!). Feel I know the car now, having driven it in some pretty atrocious weather; including a "little moment" exiting an oil-covered roundabout!!. Still can't believe the handling - even on the occasional time when the tail has stepped out, you just grab it again and it's all so positive. 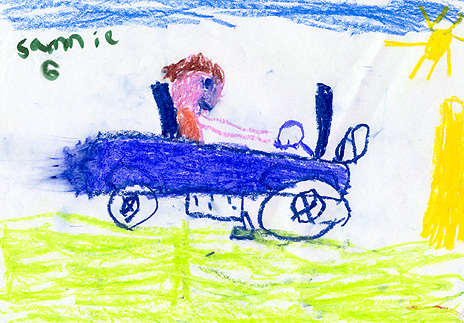 These cars must be the closest things on the road to Karts. The previous owner has called me up several times and is clearly missing his baby! Finding the hood much easier to put up (thanks to an article by Mike Bees on blatchat). I've always loved the sound of V8 TVR's but have now found a tunnel that I drive through and it sounds like Concorde taking off....sorry if you live near there!! 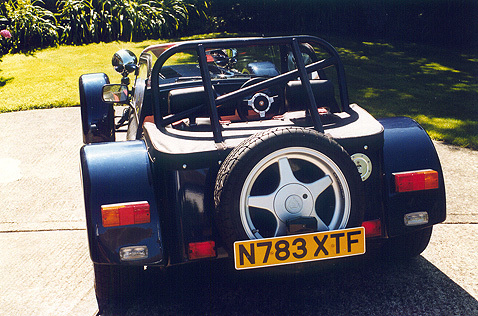 In the Summer, when I was considering buying such an impractical car, it did occur to me that I might regret having such an expensive toy tucked away in the garage over the long Winter months (especially this week when brass monkeys have been on the lookout for welders!)... Well so far I don't regret it! It just makes you appreciate the times when you can use it, and it keeps the mileage down, and the value up.....Hang on....Is that a speck of blue sky I can see between the snowflakes? - must go for a blat! Yes, despite my good intentions of "dry wintering" the beast, I can't resist taking it out for an adrenaline fix when the weather is fine, average, present! It's not much fun driving with the roof up though - everything, including the dials, fogs up and it actually feels quite claustrophobic as I've yet to discover a way of letting air into the cockpit when everything is watertight. Spent a fun afternoon at the Se7en's List meet last month in Oxford; it was great to meet some other owners and also to watch the locals' reactions as 30 head-cases roared through their quiet villages. It was also a fantastic sight seeing so many Seven's in one place (outside of the confines of the Caterham showroom that is). Took the car in to James Whiting for its annual service last week (200 quid including MOT). He did the biz on the engine as it's revving out beautifully now. He is also an interesting bloke to chat to as I doubt there's much he doesn't know about these cars. Also had to shell out 120 quid for a new tyre which I eventually got directly from Michelin (Caterham now put Avons on the new cars) and a new battery (which Vecta Immobilisers are apparently tough on). Car still going like a dream. Had great fun 'impressing' a yuppie in a Ferrari 355 the other day. I was coming home from work, taking one of my normal shortcuts down a winding road (actually it's not a shortcut at all but in a Seven such roads are a mandatory part of any trip!). Anyway up ahead, this very red, very shiny, prancing horse thingy pulled out of a side road. I gave the throttle a little prod and before I knew it was right up his very expensive exhaust pipes. I could see the driver looking in his mirrors and thinking "prat in a vintage/kit-car, more revs required to demonstrate power of vastly superior supercar...". So he gave it some stick and with not too much effort, I stayed right behind him for a couple of miles. I don't think I could have actually passed him, but he certainly looked surprised when we eventually caught up to some slower traffic and I was still there - so much so that when I turned off, he nearly fell out of his car trying to see what make of car I was driving. I could almost imagine him marching back into the showroom the following day, demanding to see the smarmy salesman who had convinced him that his 90 odd grand was buying him a motor that only Schumacher would be able to catch. I've got a mate with a Volvo T5 Estate who is always telling similar anecdotes! Flying in very close formation through the roundabouts of Didcot. Weaving past (comparatively) stationary traffic. Locking up (at the last minute) when James' V8 in front suddenly ran out of fuel. Leaving the road momentarily over a humpback bridge (and finding the sump still in one piece). It's one of the only ways that you can get to drive one of these cars properly. The limits of this car are way beyond what could safely be explored on a public road. I want to do another one! The format of the day was very informal. The 40-odd cars were divided into groups of about 8 and then each session lasted 15 minutes. I did 5 sessions throughout the day. At first we were in a group of just Sevens but as the day wore on, the cars in each session were mixed up. You could go as fast as you liked and there were really only two rules; you were not allowed to pass other cars going into a corner and you were only allowed to pass once the driver in front had indicated for you to do so. It was fantastic fun and having done quite a bit of karting, I soon found the right line and began pushing the car harder each lap. The inevitable happened and I eventually lost it on a couple of corners, but that wasn't a problem as there was acres of space to "go agricultural". My car quite predictably oversteers and after a bit of practice, I found myself holding each powerslide and gently driving out of it, rather than snatching the car back into shape. Easytrack had provided some braking markers which were being used by the assorted tin-tops in attendance, but it soon became clear that I could comfortably brake about 5 metres later than most of them. 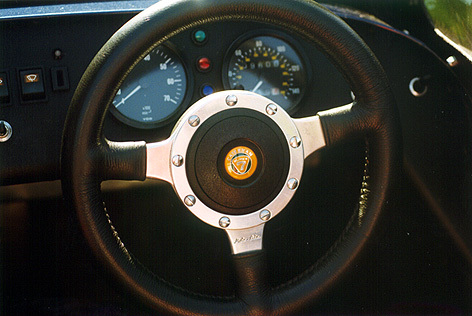 The handling was embarrassingly superior to the majority of the other cars - most of the Sevens drivers were constantly passing the assorted Elise's, Imprezza's, TVR's etc but the extra power of my car, gave me an added advantage out of each corner. I can recall having to pull over to let one car past - a 400 bhp Nissan Skyline which was so awesomely quick in a straight line that he negated any cornering advantage and was passing everything. My tyres were quite scuffed after a day of this treatment but there's still some tread left so I'm wondering if I could have gone a bit faster!! 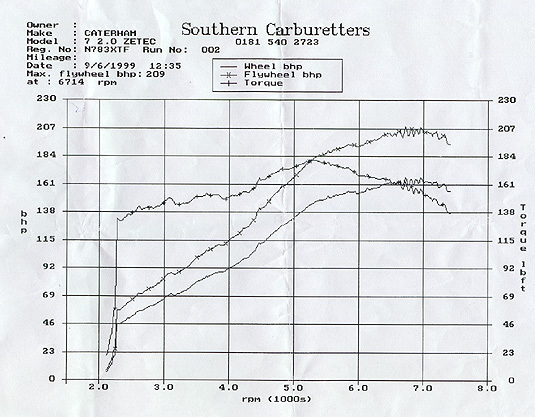 Incidentally the noise level of the exhaust was measured at 103 db (1 metre from the pipe @ 4000 rpm), which means the car in its current guise would be ineligible for circuits like Goodwood. One problem with owning a car like this is that it tends to be high on your "Assets that convert easily to cash" list. This summer we're moving back to New Zealand for a couple of years and although I could have taken the car along with everything else, it seemed less complicated to sell it. That decision was not reached as quickly as I've just typed it, and even now I'm wondering whether I've done the right thing... but hey, it's not the only car in the world (he said, trying to convince himself....). 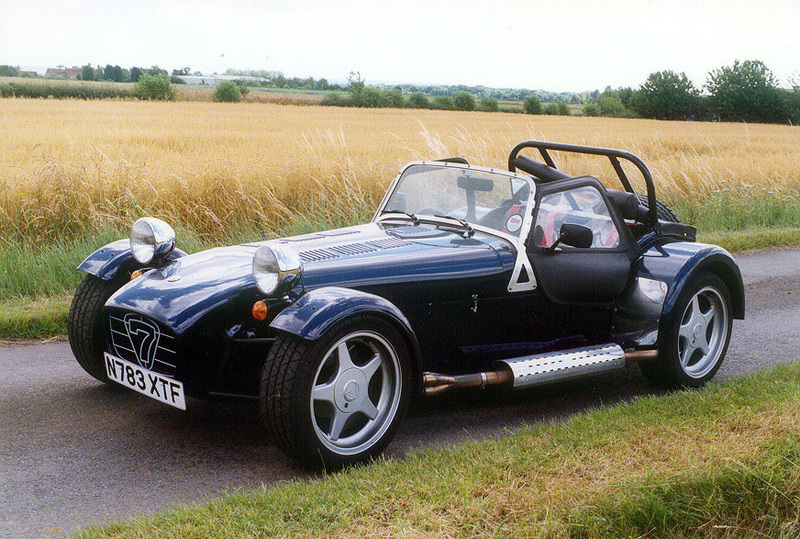 I have really enjoyed owning a Caterham and it has actually taught me a lot about driving. I am also thankful that I owned one for almost two years without either crashing it or suffering any kind of mechanical failure (apart from a leaking radiator). They are excellent little cars. If you get the chance to own one, GO FOR IT.